Participants: Tété-Michel Kpomassie, Jean Barberis, Matthew Gribbon, Fabienne Lasserre, Ranbir Sidhu. Moderated by Michelle Levy. In conjunction with the exhibition Arctic Book Club: Artists Respond to An African in Greenland, EFA Project Space and Flux Factory welcome Tété-Michel Kpomassie in person to exchange questions, thoughts and reactions with the artists who have just spent the last five months reading and creating work in response to his book (resulting in the current exhibition). Jean Barberis, curator; Fabienne Lasserre and Matthew Gribbon, participating artists; and Ranbir Sidhu, book club moderator and contributing writer, will speak on behalf of the Arctic Book Club members, who will be present, in full, in the audience. 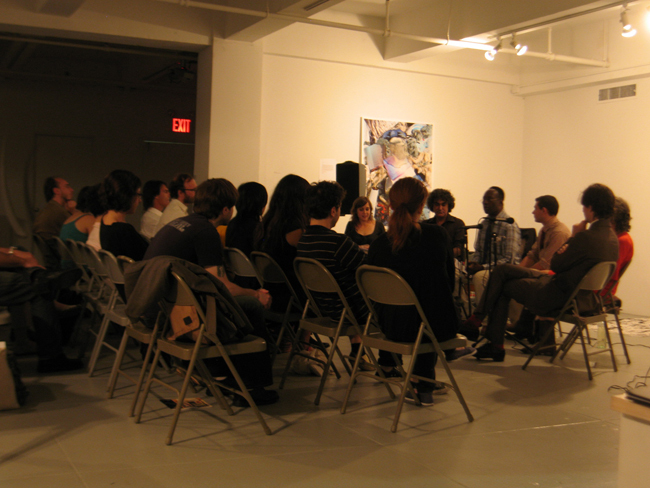 In the Spring of 2009, Flux Factory and EFA assembled a cross-disciplinary group of artists to respond to Tété-Michel Kpomassie’s book, An African in Greenland, meeting regularly in the form of a book club. Upon completion of the book, the artists created new work inspired by their experience. An African in Greenland is the account of Kpomassie's unique odyssey from his native Togo to Greenland. As a young man living in Africa, Kpomassie happened across a children’s book about Greenland. Fascinated, he embarked on a remarkable ten-year journey across Africa and Europe, working as a translator along the way, and eventually making his way to live in Greenland. Tété-Michel Kpomassie is a writer originally from Togo, who currently resides in Nanterre, France. He is the author of An African in Greenland, for which he was awarded the Prix Litteraire Francophone International in 1981. Jean Barberis is the Artistic Director and co-founder of Flux Factory's gallery space, LIC, New York, and co-curator of Arctic Book Club. 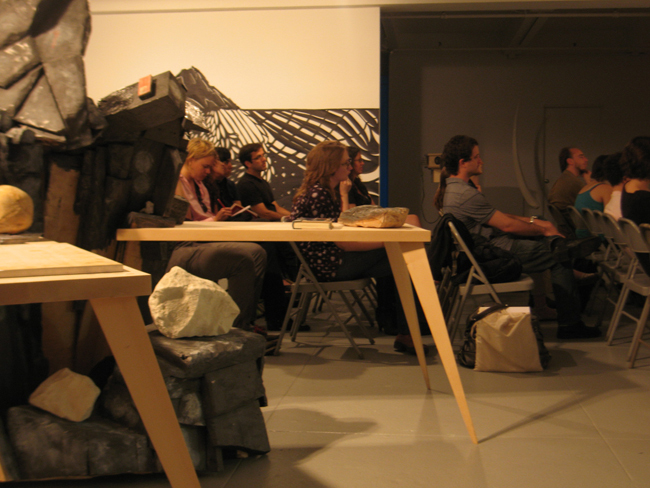 Fabienne Lasserre is a mixed-media artist who lives and works in Brooklyn, and Arctic Book Club participating artist. Ranbir Sidhu is a novelist and playwright, the moderator for the Arctic Book Club reading group, and contributing writer to the exhibition. Michelle Levy is the Program Director of EFA Project Space and co-curator of the exhibition.